Following on from Sarah McMenemy's gorgeous fold-out books, this beautiful rendition by Charlotte Trounce really typifies the glory of our country, its beauty, its icons and its nuances. 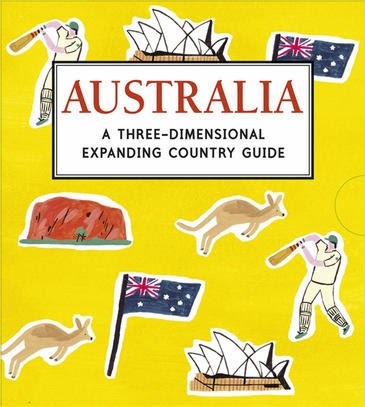 Slid into a little box-like folder, the book can be slipped from its case and unfurled like a concertina, with cut-outs and pop-ups of iconic Australian scenes, including Sydney's opera house and bridge, Parliament House, The Twelve Apostles, Port Arthur, Kakadu and the Great Barrier Reef. Concise text rounds out a series of gorgeous watercolour images that beautifully capture our country's natural and man-made beauty. A wonderful gift in celebration of Australia's national day. See our reviews of the other books in this series--Paris and the Metropolitan Museum of Art here, and London here.